HTRXS7A2 Protect your hearing and listen to the radio - at the same time. 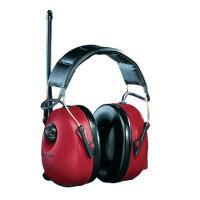 Designed for people who work outdoors to protect their hearing and let them listen to the radio at the same time. Excellent FM reception. Extra wide, soft, padded headband distributes weight while two-point suspension exerts low pressure for comfortable, long-term use. Battery lifetime approx. 200 hours.